Noble gas molecules have been detected in space for the first time in the Crab Nebula, a supernova remnant, by astronomers at UCL. Led by Professor Mike Barlow (UCL Physics & Astronomy) the team used ESA's Herschel Space Observatory to observe the Crab Nebula in far infrared light. Their measurements of regions of cold gas and dust led them to the serendipitous discovery of the chemical fingerprint of argon hydride ions, published today in the journal Science. The findings support scientists' theories of how argon forms in nature. The Herschel Space Observatory, an ESA space telescope which recently completed its mission, is the biggest space telescope ever to have flown. Herschel's instruments were designed to detect far-infrared light, which has much longer wavelengths than we can see with our eyes. "We were doing a survey of the dust in several bright supernova remnants using Herschel, one of which was the Crab Nebula. Discovering argon hydride ions here was unexpected because you don't expect an atom like argon, a noble gas, to form molecules, and you wouldn't expect to find them in the harsh environment of a supernova remnant," said Barlow. Discovering argon hydride ions here was unexpected because you don't expect an atom like argon, a noble gas, to form molecules, and you wouldn't expect to find them in the harsh environment of a supernova remnant. In addition to mapping the dust by making far-infrared images of the nebula, the team used Herschel's SPIRE instrument to make spectroscopic observations. In these, the infrared light is split up and dispersed according to its wavelength, much like a prism breaks white light down into its respective colours. When they looked at the data, the team saw some very unusual features which took some time to fully understand. "Looking at infrared spectra is useful as it gives us the signatures of molecules, in particular their rotational signatures," Barlow said. "Where you have, for instance, two atoms joined together, they rotate around their shared centre of mass. The speed at which they can spin comes out at very specific, quantised, frequencies, which we can detect in the form of infrared light with our telescope." Elements can exist in several different versions, or isotopes, which have different numbers of neutrons in their atomic nuclei. The properties of isotopes are very similar to one another in most respects, but they do differ slightly in mass. Because of this mass difference, the speed of rotation depends on which isotopes are present in a molecule. The light coming from certain regions of the Crab Nebula showed extremely strong and unexplained peaks in intensity around 618 Gigahertz and 1235 GHz. Consulting databases of known properties of different molecules, the scientists found that the only possible explanation was that the emission was coming from spinning molecular ions of argon hydride. Moreover, the only isotope of argon whose hydride could rotate at that rate was argon-36. In this case, energy from the neutron star at the heart of the nebula appears to have ionised the argon, which then joined with molecules of hydrogen to form the molecular ion ArH+. Professor Bruce Swinyard (UCL Physics & Astronomy and Rutherford Appleton Laboratory), a member of the team, added: "Our discovery was unexpected in another way - because normally when you find a new molecule in space, its signature is weak and you have to work hard to find it. In this case it just jumped out of our spectra." The discovery of argon-36 in the Crab Nebula, as well as being the first detection of its kind, helps support scientists' theories of how argon forms in nature. Calculations of what elements are churned out by a supernova predict a lot of argon-36 and no argon-40 - exactly what the team observed in the Crab Nebula. On Earth, however, argon-40 is the dominant isotope as it is released by the radioactive decay of potassium in rocks. This first discovery of an argon molecule in space continues a long tradition of noble gas research at UCL. Argon, along with the other noble gases, was discovered at UCL by William Ramsay at the end of the 19th century. 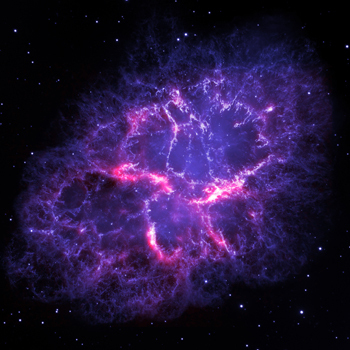 Image Caption: In blue, visible light from the Crab Nebulam seen by the Hubble Space Telescope. This comes from emissions of gases in the nebula, which are energised by the neutron star at the centre. In red, far infrared light seen by the Herschel Space Observatory. This comes mainly from cold dust and gas.